Lighting a scene to photograph in a pleasing way is either a matter of luck, or the combination of two skills: knowing the physics of light (that is, knowing the results you'll get from lighting decisions), and having the creative sense to use that knowledge toward an aesthetically-pleasing end. For my part, I generally go with the “luck” option, but that's about to change. 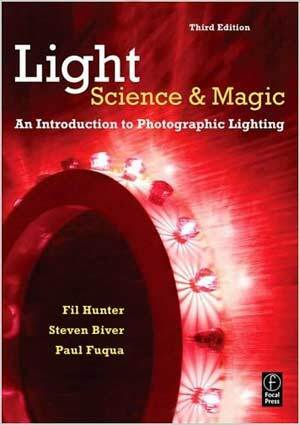 I've recently started reading Light — Science & Magic: An Introduction to Photographic Lighting, and the first chapters have made me positively giddy with expectation. As I lamented once before, good photographers apparently make bad writers (with the most poorly written book I've ever seen, on any subject, being by a photographer). There are plenty of great writers – Bill Bryson is one of my favorites, and those books about a hairy potter are apparently pretty good – but time and again, the books I see about photography are horrible. So, it was with growing excitement that I read the early pages of Light: Science and Magic (third edition, by Fil Hunter, Steven Biver, and Paul Fuqua). It was clear early on that these guys are excellent writers, knowing both what to say and how to say it. Styles of photographic lighting have changed and will continue to do so. Light — Science and Magic does not go out of style because it was not, is not, and will never be based on style. The book is based on the behavior of light, and its principles will not change until fundamental physics does. Light — Science and Magic is a discussion, not a lecture. You bring to this discussion your own opinions about art, beauty, and aesthetics. We do not intend to change those opinions and may not even influence them very much. We will be more bored than flattered if reading this book causes you to make pictures that look like ours. For better or worse, you have to build your own pictures on your own vision. To photographers, the important principles of light are those that predict how it will behave. Some of these principles are especially powerful. You will probably be surprised to find how few they are, how simple they are to learn, and how much they explain. In this first chapter they then go on to list three important principles before moving on to other introductory things like “Film or Digital?,” how they chose their examples, etc. ... you try all of the basic examples in this book. Do not simply read about them. What happens in your head is the most important part of lighting, but the eye and the hand are still essential. Guided experience coordinates the three. What is the “Magic” Part of this Book? Learn about the light and the science. The magic will happen. Well, probably not in my case, but again, excellent writing. In this chapter we are going to talk about light, the raw material from which we make pictures. You, reader, are already familiar with most of the ideas we will discuss. This is because you have been learning to see since the day you were born. Even if you happen to be a novice photographer, the occipital love of your brain has enough information about the behavior of light for you to be a master. We want to attach words and labels to some of this unconscious and semiconscious information. This will make it easier for us to talk about light with other photographers, just as musicians find it easier to say “b flat” or “4/4 time” instead of humming a scale or tapping a rhythm. This is the most theoretical chapter in this book. It is also the most important, because it is the foundation for all that follows. Okay, so that first paragraph is a bit wordy, but their presentation is just excellent. The book not only tells you what you need to know, but they frame it so that you know why you need to know. The chapter then describes some of the basic physics of light, and then uses that description to clarify common concepts like brightness, color, and contrast, all in tangibly-meaningful ways. It talks about how the subject being photographed can affect light (refraction, transmission, absorption, and reflection). It shows lots of photos that illustrate what they're talking about. Reflection is light striking a subject and bouncing off. You know that and need no further explanation from us. The concept is easy because we use it daily. Reflection makes vision possible. We do not see objects; we see light. Because most objects produce no light, their visibility depends entirely on light reflected from them. We do not need to show you a photograph of reflection. Almost any picture you have on hand will serve the purpose. However, the familiarity of reflection does not mean that it needs no further discussion. On the contrary, its importance demands that we devote most of the next chapter to it. Writing this good is not born in a vacuum. I get the distinct feeling while reading that these guys spent a lot of frustrating years reading poorly-written books on photography, and decided that dammit, they weren't going to produce the same crap as everyone else. Their writing is not simply good, but purposefully good (whatever that means; I'm not exactly sure myself, but it seems to be somehow appropriate). I'm only a short way into the book, and on the content front, the first two chapters have me looking very forward to the remaining ones. But on the writing front, already this book has taught me something wonderful: it is possible for a photographer to write well. We’ve ordered this book and I’m looking forward to reading it. Thanks for the recommendation. I found this book to be really helpful in reminding me of things everyone already knows, but never thinks about. I am currently working with a D50, several lenses, and picked up a couple SB-28 flashes and Elinchrom Skyport radio triggers. I am generally very pleased with “creating light” instead of either relying on fast glass or missing shots.